The best grand prix racing stories are not always those that get told. The Grand Prix Saboteurs came frighteningly close to remaining in that province. 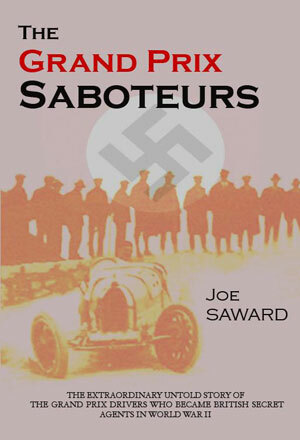 It was only author Joe Saward's unwavering determination to tell the tale that enabled it finally to see the light of a publishing day, and then only because he grasped the bull's horns and set up his own operation to produce it (excellent value at £12.99 in paperback form). Along the way he had to put up with rejection by unimaginative publishers (who, if they read this book now will surely feel embarrassed by their lack of foresight), and plagiarism by some authors who would never have discovered many of Ôtheir' facts without access to Saward's research which one interviewee chose not to return to him, after he had left it with them simply to prove his bona fides. The further the world moves away from the distant days of racing in the Twenties and Thirties with each passing year, the easier it is for people to rely on dogma and the so-called established word of the era. It helps that Saward has invested 18 years of research into this epic, just as it did that the British Government finally released some more key documents in 2003 that enabled him to prove, to his own satisfaction, that he had generally drawn accurate conclusions from all his painstaking detective work of the past. Thus are we in a privileged position to learn much more about the motor racing careers of two of its central characters - English-born Willie Grover, the man who won the first-ever Monaco GP in 1929; and Frenchman Robert Benoist who, had such a thing existed in 1927, would have been that season's World Champion for Delage. The outcome is a fascinating and long overdue insight into an underwritten era of motorsport history. But it is significantly more than that, for it also embraces World War II and the events that led both to work for Maurice Buckmaster's shadowy Special Operations Executive in France against the occupying Germans, and ultimately to their grisly fates. Saward's unflinching forensic investigation into a complex true story that is a combination of sporting endeavour and world conflict, puts flesh on the bones of long departed ghosts from racing's past and rattles along with all the drama and pace of a John Le Carre thriller. And it does not shrink from putting accepted wisdom into fresh perspective. British resistance heroine Violette Szabo, it transpires, may not have been fully deserving of all the praise heaped upon her posthumously, both in terms of military honours and the film Carve Her Name With Pride. Yet Saward has not sought to debunk icons for the sake of it; what he says about Szabo is said respectfully in a straightforward interpretation of the facts he has unearthed from myriad official sources. Nor is he opprobrious in his revelation of Maurice Benoist's betrayal of his own brother; the former is simply judged by the truth. This is an important addition to the libraries of any true grand prix aficionados, who will find themselves in thrall to the courage not just of men such as Grover and Benoist, but also to women such as Szabo, Denise Bloch and Andree Borrell who resisted with equal zeal. As a social document, and a tribute to the oft-unsung members of SOE, The Grand Prix Saboteurs stands as a towering monument to those who chose to stand and fight, and, when their time came, to pay the ultimate price for their passionate belief in freedom.